Yamaha Corporation of America, Inc. manufactures and markets musical instruments, audio and visual products, music production tools, commercial audio products, and live sound products for the United States markets. Its musical instruments include pianos and keyboards, guitars and basses, drums, marching instruments, percussion products, student percussion products, brass and woodwind products, strings, and specialty musical instruments; and audio and visual products comprise AV receivers, sound bars, wireless streaming amplifiers, Hi-Fi components, speakers, home theater systems, desktop audio products, mini-systems, headphones/earphones, accessories, and Blu-ray compact disc players. Yamaha Corporation of America, Inc., manufactures and markets musical instruments, audio and visual products, music production tools, commercial audio products and live sound products for the US market. The company’s musical instruments include pianos and keyboards, guitars and basses, drums, marching instruments, percussion products, student percussion products, brass and woodwind products, strings and specialty musical instruments. Yamaha also produces audio and visual products comprised of AV receivers, soundbars, wireless streaming amplifiers, Hi-Fi components, speakers, home theater systems, desktop audio products, mini-systems, headphones, accessories and Blu-ray compact disc players. Yamaha Corporation of America, a wholly-owned subsidiary of Yamaha Corporation in Japan is one of the most widely-known companies offering musical instruments, audio/visual, and computer-related products. 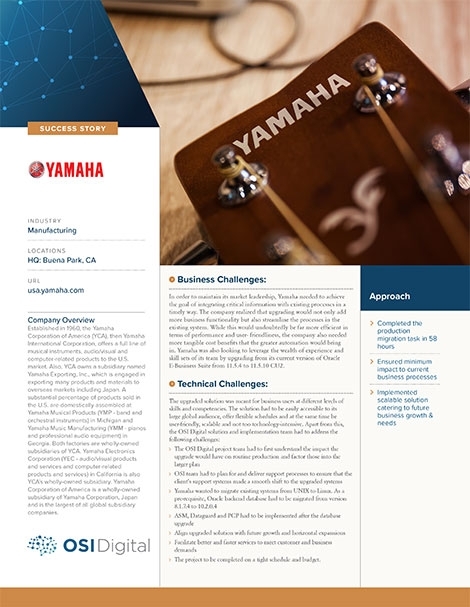 To maintain its market leadership, Yamaha required integration of existing processes to provide the timely availability of critical information throughout the company. The company determined that upgrading its current version of Oracle E-Business Suite would add business functionality, streamline the processes in the existing system, increase performance and user-friendliness and enhance automation. With a hard timeline in which to implement the entire upgrade and conversion, OSI deployed a multi- shore development and support process, and executed the upgrade in three phases. These phases consisted of getting the script sequencing right and identifying all project patch requirements, incorporating most of the key developed code, and ensuring that all the modified and newly-developed code was in place respectively. The solution had to be easily accessible to its large global audience, offer flexible schedules, and be user-friendly, scalable, and not unduly technology-intensive. OSI Digital’s effective planning and conversion resulted in 100% system stability, without a single instance of crash or system failure for Yamaha.